Intersection of Melrose/La Cienega/Clinton, on the new building at the Center for Early Education. 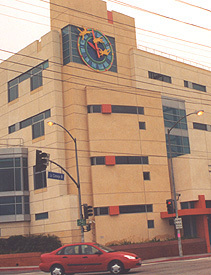 One of the largest public clocks in Los Angeles. 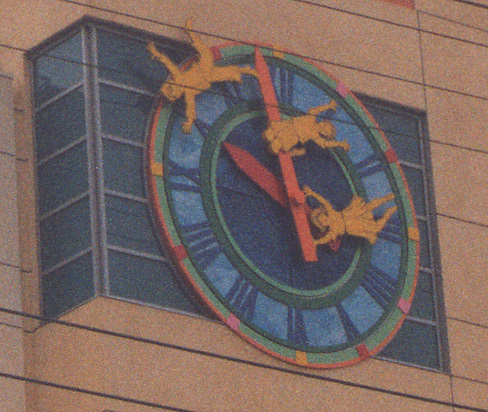 "At 12.5 feet in diameter, the clock provides a focus of whimsy and color in the frenetic urban jungle....Never the same within a twelve hour period, 'The Children's Clock' offers the public an artwork which is in a perpetual state of change....[It] is fabricated of opalescent glass with large metal clock hands upon which the figures of three larger than life children play, seeming to defy gravity and traditional constraints. Information about the works has been gleaned from the Art on the Outside press release. Photographs by Ruth Wallach, taken in October, 2003.